Title: Who's In My Family? About the book: Who's in My Family is a book series which speaks about different types of families found all around a community. The book begins with two siblings, Nellie and Gus, preparing for their day trip to the zoo with their mother and father. During this trip we hear about all the different family members that can make up a family and how not all families are the same. The book also discusses the different homes a family can have along with the different foods and hobbies each family can practice. While each different family is being discussed, Nellie and Gus are relating back to each family, finding the similarities between their family and the others in the community. The book is filled with expansive illustration that administers a message just as strong as the words do. Each page is filled with so much detail in the pictures that a child who is unable to read can still understand the sequence of the story. The book ends by saying that no matter how different each family is, everyone in the family loves each other. SJE Element 2: Harris provides a very strong message about diversity and cultures in a community all the while keeping it light and simple for young children to understand. Right from the start she begins to explain how homes vary and how each individual has a different style of eating and traditional food based on the family culture. Harris did an excellent job on breaking down the different members a family can have from single-parent, to adopted children, mixed-raced and even families with no children or no parents. Additionally, the outlook Nellie and Gus had on seeing all these different families in their neighborhood was a positive one. They were accepting of all the variations which make up a family and showed respect for the traditions and habits of the families. This book does an excellent job with showing the readers how different everyone in this world is and how no matter the difference, they are all considered equals. I believe the story does an excellent job of showing off diversity in a community and most importantly shows children how to be respectful of each and every family, no matter the culture or make up. 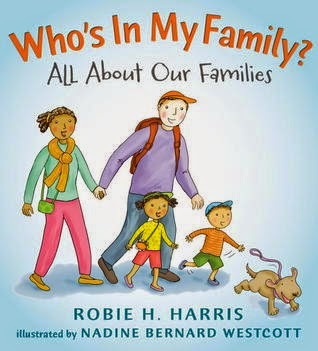 Classroom Activity: Who's In My Family is a great book to introduce young children to different cultures and family traditions that everyone has. Because it's main focus is family and traditions the book could be read at any point during the year and can be made into a great lesson about acceptance, respect, and equality. As a teacher I would use this book to encourage students to learn more about their families and the traditions they practice. Children could have a show and tell where they bring a picture of their family and speak about what they eat, holidays they celebrate, and activities they do together. Teacher's could even take it a step further and make a class mural with each student having their own section to show off what represents their family. Having this mural up in the classroom or in the school will create the meaningful message about the vast diversity that can be found in one small community.